Is there an official LEGO terminology for the features of basic pieces? When I read this question I remember to regularly ask myself what the features of bricks are called. At the top are there nibbles, knobs, or studs? At the bottom are there tubes? New bricks also have little "support walls" (?) at the bottom, known from DUPLO, how do you call these? 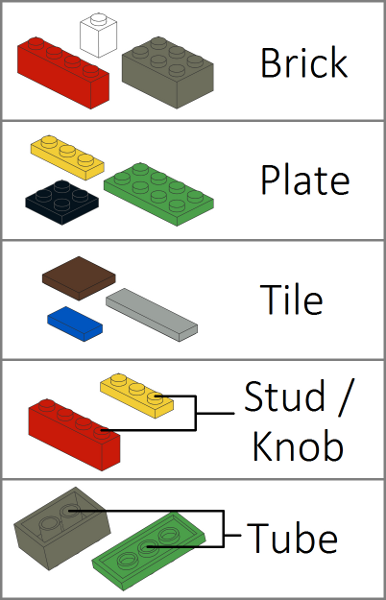 Is there an official LEGO terminology at least for the most common types of features shown in this image? For an official position, you may want to check older LEGO catalogues or instructions to see if they're naming things, and how. While you can find some names for complete elements in, for example, service parts catalogues, I don't think you'll find much for specific subparts. Given the 1958 patent illustration, it's likely the patent itself named subparts, and more specifically studs and tubes. The original Kiddicraft patent called studs "bosses", by the way. Keep in mind LEGO has, until recently, be very protective of what it's been doing internally; as such, the community as a whole didn't have much info, so that a lot of current nowadays terminology isn't official, but rather derived from public habit. However, that's changed a lot recently, and LEGO isn't as shy as it was when it comes to publish internal data such as colour names and numrical IDs, design IDs, parts IDs, and even part names. The only problem is that they never bothered to have a truly consistent naming scheme, and the fact that English isn't the main language of Denmark doesn't help. Yet it does help us find official subpart names, which we can hunt through the online pick-a-brick selection. The first one is a shocker: the "stud" is, in fact, called "knob" (the fan-nicknamed "jumper plate", or LDraw's "Plate 1 x 2 with 1 Stud", being officially a "Plate 1X2 W. 1 Knob", and there are numerous other examples). The clip is a "holder" (LDraw's "Brick 1 x 1 with Clip Vertical" is "Brick 1X1 W. Holder, H0rizontal" (sic) or sometimes a "snap" (LDraw's "Bar 7 x 3 with Double Clips" is "Lattice 1X4x6 W. Snap"). The bumpy-things on the top of a brick are called studs. At the bottom of the brick, the holes that the studs go into are called tubes. As far as I know, there are no parts of a brick called nibbles or knobs. Yes, here is the basic terminology Lego bricks names list. What does the acronym MOC stand for? Does the basic 2 x 4 brick have a common nickname? What are the armless minifigures from the LEGO boardgames called? What is the “Module” of a LEGO gear? Does the word Lego have anything to do with Latin verb lego?